I can't believe that my little nephew is almost here! Last weekend I threw Kirsty a baby shower as she's just 8 weeks away from her due date. Inviting her friends, our close family and colleagues, I found a lovely venue and started planning what food and decorations we'd need. 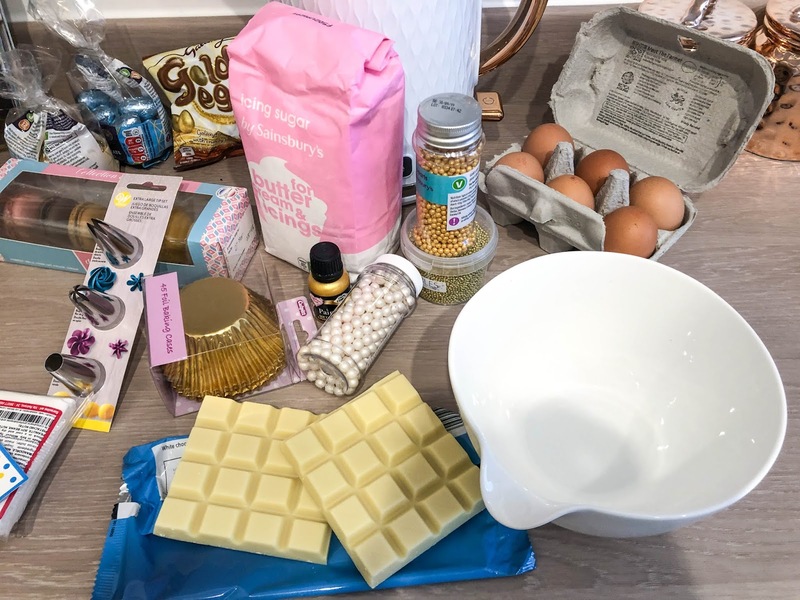 I decided on a white and gold theme and headed straight for Pinterest for some pretty cake ideas. Letter cakes have been such a big thing on Instagram and Pinterest for the last year or so, I just had to try my hand at creating one for Kirsty's special day. 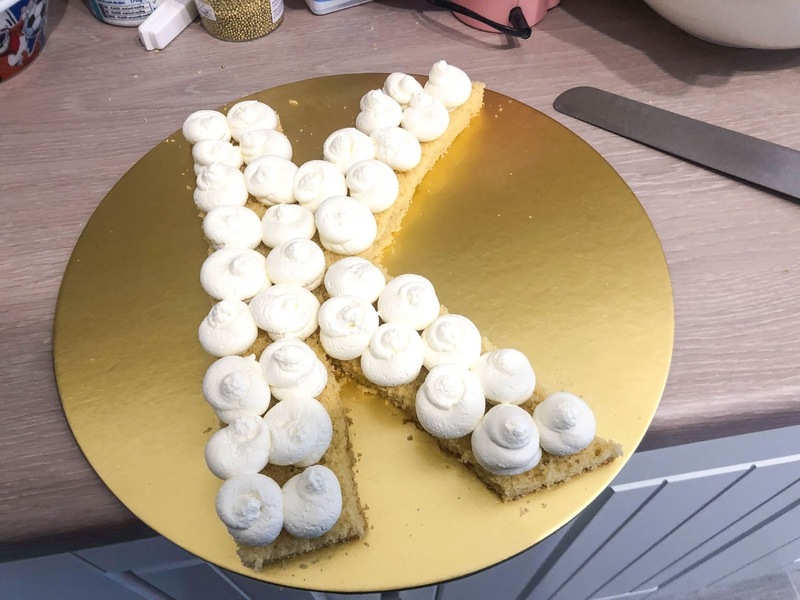 With a fluffy sponge and super sweet springy icing, I managed to create the perfect letter cake recipe which I've detailed below.. read on to find out how to create your own letter cake! I was lucky enough to have had the chance to work with the Steamer Trading* store in St Albans, which underwent a renovation and refit this week and is due to reopen on 22nd March. 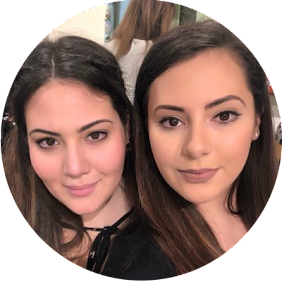 To celebrate this, they challenged me to create a recipe using some professional standard equipment from their ProCook range! 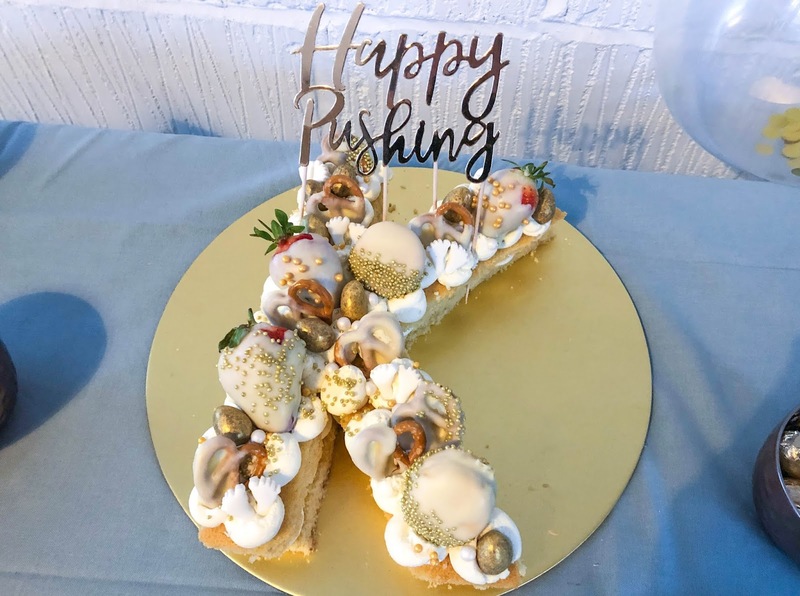 Using their porcelain mixing bowl set, I started creating the letter cake by first making the decorations in the form of white chocolate covered strawberries, macarons and salted pretzels. I had no idea how many of each decorations to do, so I just did 8 strawberries, 4 macarons and 8 pretzels, but only ended up using half the strawberries and macarons. Melting the white chocolate in the microwave, I washed the strawberries before lining a baking tray with greaseproof paper, ready to put the chocolate-dipped toppings onto to set. 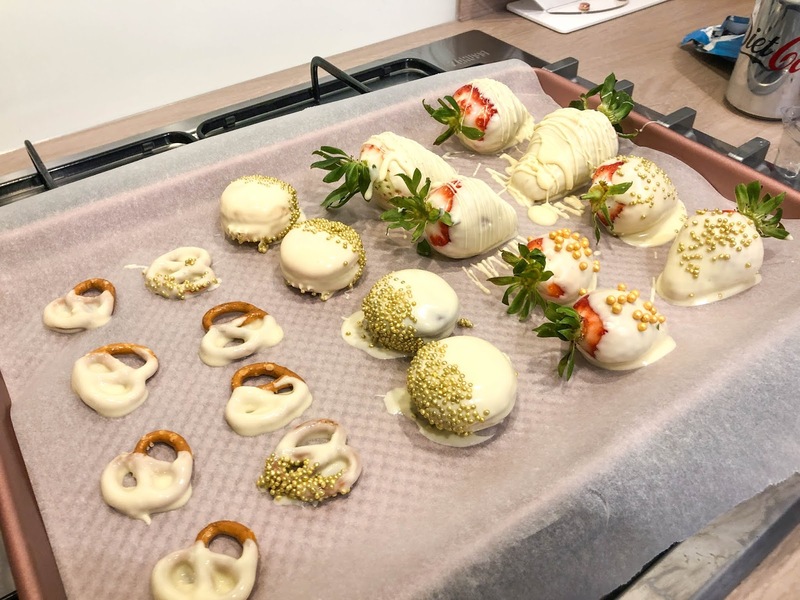 Using a fork for the macarons and pretzels and holding the stem of the strawberries, I dipped the items into melted white chocolate and decorated with gold sprinkles and pearls. Once all toppings were covered, I put the tray in the fridge to set for 10 minutes. 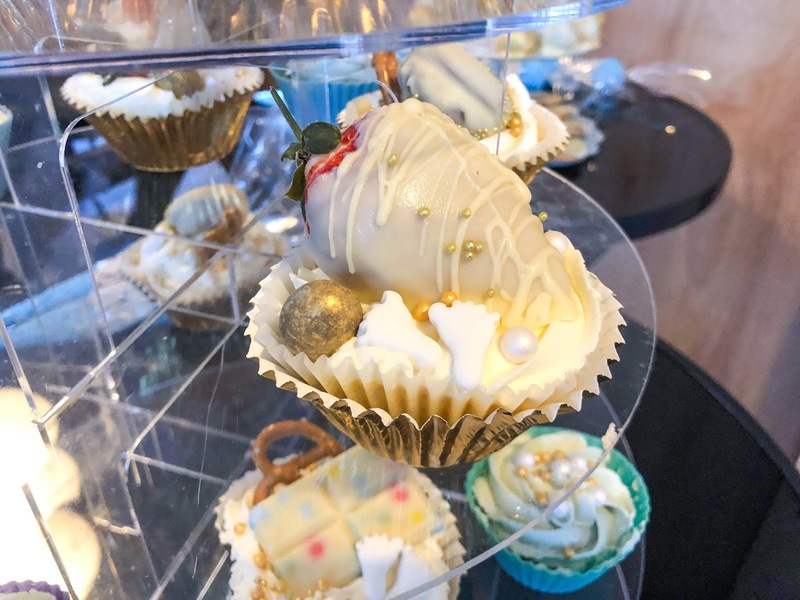 Once set, I trailed some more white chocolate over a few of the strawberries to create a raised stripe pattern which I would later paint using edible gold paint. I then returned the tray to the fridge whilst I made the rest of the cake. As I'd not made one of these cakes before, I thought the best thing to do was to use my tried and tested vanilla sponge cake as it is light and fluffy and tastes great with any topping/filling. 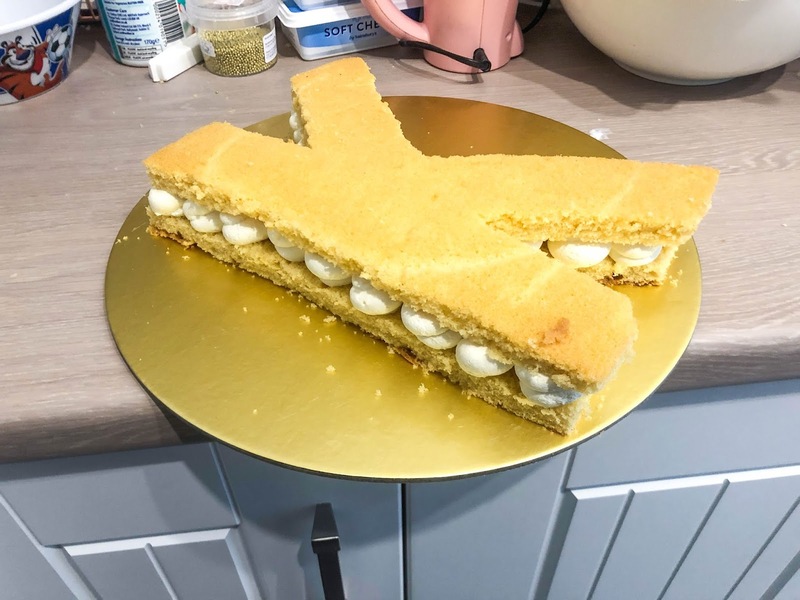 Using a high sided rectangular baking tray, I chose a size that would be big enough to decorate and easy enough to cut a letter out of once it had cooled. Heat the oven to 180ºc/160ºc fan. Grease and line a large straight sided rectangular cake tray. Place the spread, sugar, eggs, flour and baking powder in a large bowl and beat well for around 2 minutes until blended and smooth. You can either do this by hand using a wooden spoon or using a hand held electric whisk. Once smooth, pour out into the lined baking tray and spread out the batter, ensuring it is flat on top. Bake in the oven for 25-30 minutes. 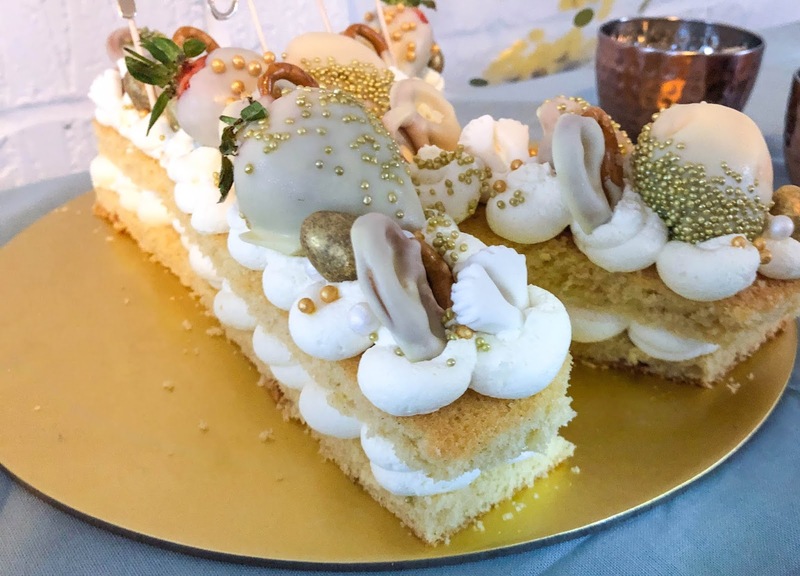 When the cake is cooked it will be a pale golden colour and the centre of the sponge will spring back into place when lightly pressed with your finger. A blade or skewer should also come out clean. Turn the sponges out onto a cooling rack, peeling off the greaseproof paper. Leave to cool for a few hours. 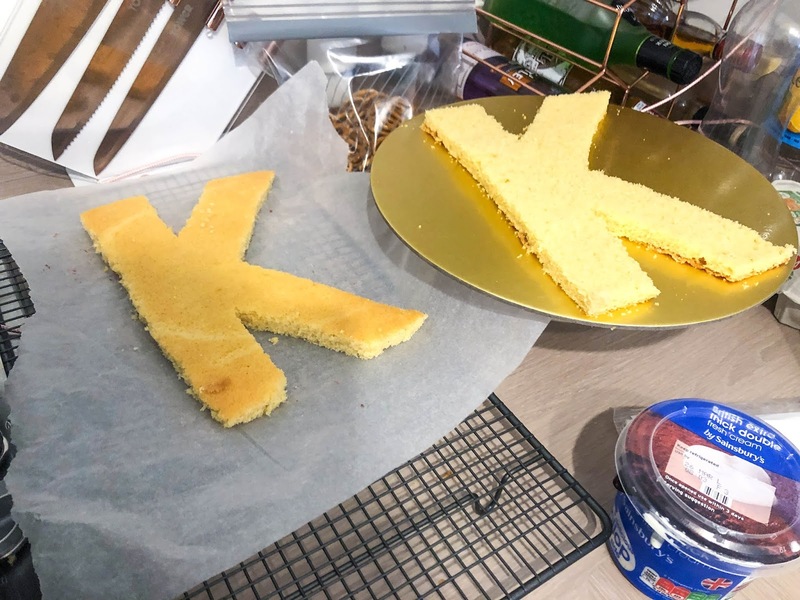 When completely cold, use a sharp knife to cut out the letter or number you would like and then use a cake cutter to slice the cake in half to create two layers. you can save the off-cuts for later to make cake pops! 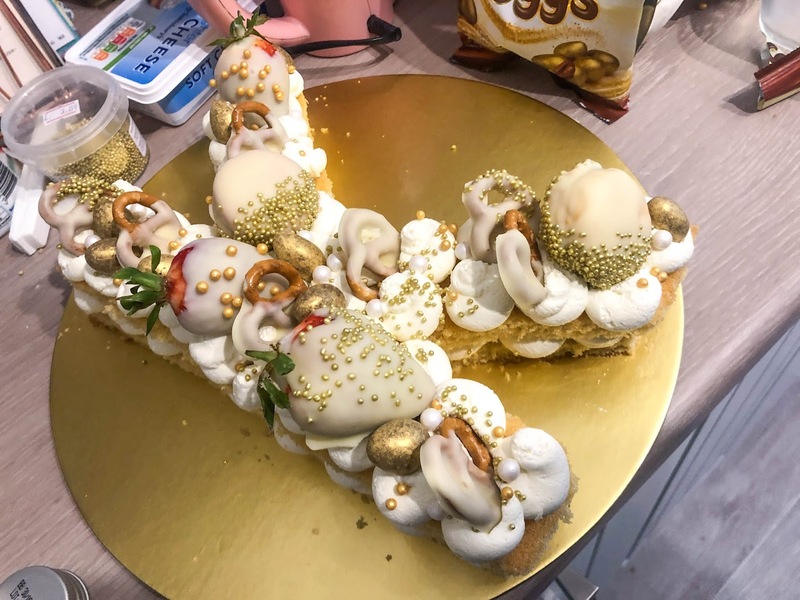 Once you have created the icing, you can add a little spoonful to the middle of the cake board/plate you will be putting the cake on to make sure it doesn't slide off. The icing for a letter cake has to be very firm and fluffy in order to give the cake height and a base for the toppings to sit on. To make this, I went for a thick cream cheese frosting that I've been making for years. Put all your ingredients, mixing bowl and whisks into the freezer for 10 minutes until completely chilled. It is important that they stay cold whilst making the icing. Using a wooden spoon, fold together the ingredients until blended. 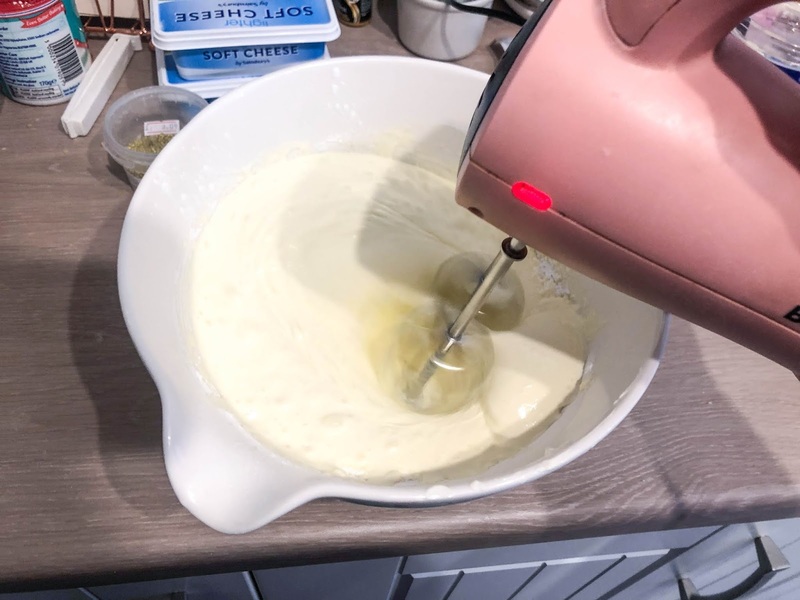 Using your electric/manual whisk, whip the ingredients together, slowly adding the icing sugar, being careful not to let the powdered sugar go everywhere. Whisk together, getting as much air into the mixture as possible until stiff peaks form. Pay close attention to the consistency as you do not want to overdo the cream cheese otherwise it will turn. Once stiff, refrigerate for 10 minutes. Using a 2A round tip piping nozzle, spoon the mixture into your piping bag and ensure there are no air bubbles whilst piping. Pipe small mounds of icing in circles on the bottom layer of the cake, covering as much as you can to raise the top layer to a height of about 1 inch. Once the whole cake is covered, place the next layer on top and repeat the process, covering as much of the cake as possible. You can then start placing your toppings onto the icing, pushing them down so they are secure. I also created some little baby feet out of modelling paste which I placed around the cake. I also used the following toppings to scatter across the cake. Be creative with this part, but don't overdo it as it can very easy go from looking amazing to looking over-crowded. For the party, I found a really cute cake topper from eBay which I added and found that round cake board from Poundland for you guessed it, £1! 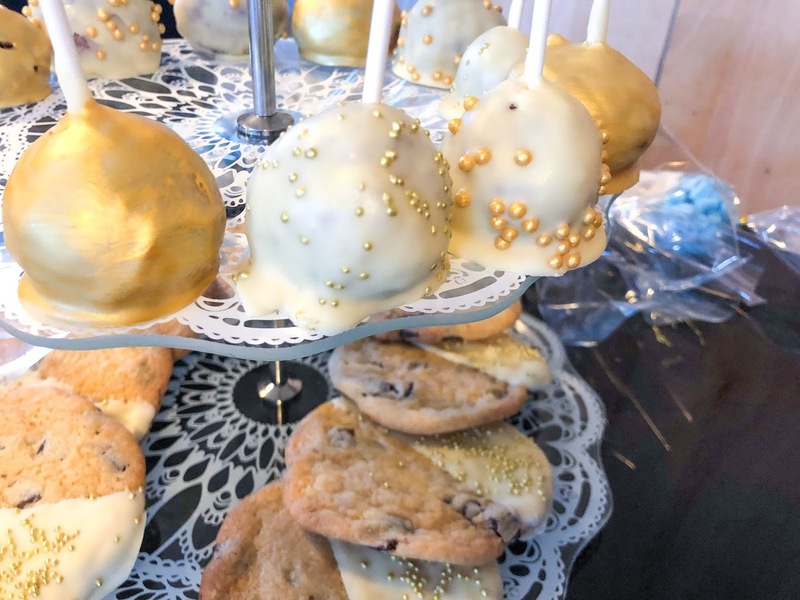 I did have some left over toppings, so I whipped up some quick cupcakes and added some frosting to the off-cuts (once crumbled) to make some cake pops and decorated them with the remaining frosting and chocolate covered decorations. I think you'll agree, they all looked pretty delicious!